It never seems like the right moment for a mother to leave her small children, and the case of Abby is no different. One stormy Saturday morning, Abby hops into her car to head to a photo shoot, something she does as a side job, only to crash and lose her life. Although this is where most stories end, this is where Abby, by W. Anne Johnson, begins. 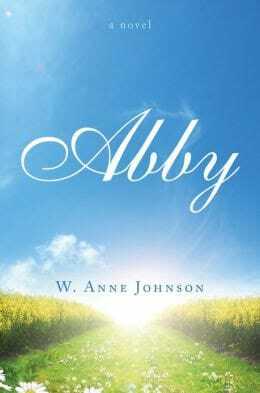 Abby, newly deceased and caught somewhere between life and heaven, needs to learn how to reach her family and help them move on after her death. Abby was one of those books I stared at for a long time before starting. I am never sure how I am going to feel reading a “sad” book, a book I know isn’t going to have a happy ending. When I started reading, I was almost instantly sucked into Abby’s world. On the very first page, Abby states she is “dead to begin with,” just as Marley is in A Christmas Carol. In a series of flashbacks, Abby shows the reader the last few days of her life and the situation surrounding her death. I was captivated by her very “normal” seeming life. Abby seemed like she could easily be someone I know, which brought this book close to home. I think every mother has the fear of leaving their children while they are still needed. I know I have. Abby addressed those fears in a very real, but comforting way. Even though it was tragic that a mother was taken from her family when they very much still needed her, this book explored the beauty of the afterlife and the idea that loved ones are not far from us even when we can’t see them anymore. I expected to feel sad when I finished this book and while I did feel some of that sense of loss that always comes from the close of a story, I felt at peace. Despite Abby’s initially sad premise, this book is full of healing and hope – the hope of having loved ones who have passed on close to us and the hope of one day getting to see them again. While the premise of Abby is based on the concepts of heaven and hell, I would say it is not overtly religious. Abby and her family do not align themselves with one religion or another and it is interesting to watch Abby reconcile her faith with her new knowledge that the afterlife exists. One of my favorite parts of the book dealt with Abby realizing that even though she may be in the afterlife, it doesn’t mean everybody has good intentions; that we are the same kind of people in the next life as we are here. Abby is a pretty quick and uplifting read. I would recommend it to anybody who wants a thoughtful book, and I think it would be especially pertinent in the case of somebody who has just lost a loved one. Abby is available directly from Tate Publishing or for pre-order from Barnes and Noble. This looks like a book I would enjoy. Thanks for the review! Interesting book! I'll add it to my list. Thanks for the review! This books sounds wonderful. I bet my book group would love it.